What: Shares of outdoor recreational product manufacturer Johnson Outdoors (NASDAQ:JOUT) plunged by 24% in May, according to S&P Capital IQ data. That slump put the stock at a new 52-week low, and down roughly 18% in the last year. Now what: The company's core business remains strong. Marine electronic sales rose 9% last quarter and the watercraft and outdoor equipment divisions also posted solid gains. In fact, the only product line that slipped was diving, and that had more to do with foreign currency swings than softer demand. Meanwhile, the biggest portion of last quarter's jump in operating costs, legal costs tied to protecting a sonar patent, will likely moderate in the future. "Next quarter we expect legal expenses to be significantly lower," Chief Financial Officer Dave Johnson told investors in a conference call. Still, investors shouldn't hold out for significant profits in 2015. 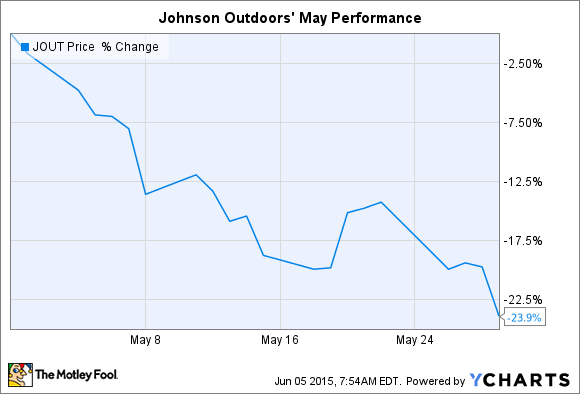 Wall Street expects Johnson Outdoors to post another loss in the third quarter, with EPS of -$0.02.